Join us Memorial Day Weekend 2019 for our first-ever Congregation Beth El Retreat at Camp Nah-Jee-Wah in the Poconos. Strengthen our community with a weekend away celebrating Shabbat and enjoying fun and relaxation in the mountains. 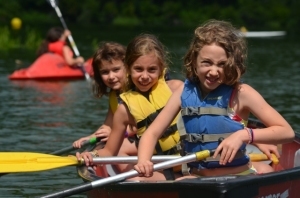 Throughout our time at camp, we will have full access to the facility, including an outdoor amphitheater for Shabbat services, athletic fields, high and low ropes courses, swimming pools, and the lakefront. Each family unit will stay in its own cabin. THE COST PER ADULT IS $275 PER ADULT, BUT DUE TO A GENEROUS GRANT FROM JEWISH FEDERATION OF GREATER METROWEST NJ AND ONE HAPPY CAMPER NJ, THE FIRST 100 ADULTS WILL RECEIVE $50 PER PERSON, BRINGING THE COST TO $225 PER ADULT. ALL CHILDREN UNDER THE AGE OF 18 YEARS OLD ARE FREE! UNFORTUNATELY, ALL OF THE DISCOUNTED RATES HAVE ALREADY BEEN ACOCUNTED FOR --- BUT WE STILL HAVE ROOM AVAILABLE AT OUR STANDARD $275 PER ADULT PRICE, AND KIDS ARE STILL FREE! A cabin with enough twin beds for your whole family, a bathroom, and a shower. You may want to bring additional blankets, as it gets cool at night in the Poconos. You will need to bring your own towels. We can begin taking advantage of the facilities at 3:00pm on Friday afternoon. Our first meal will be Shabbat dinner on Friday evening. Then, the final meal provided by camp will be lunch on Sunday. Following lunch on Sunday, we are welcome to continue using the camp facilities until 3:30pm. Please join your fellow Beth El members for this special community building experience. Finances should never be a barrier to participation in any Beth El program, especially a retreat. If you would like to attend, but need financial assistance, please contact Rabbi Olitzky for a confidential conversation. For questions about the retreat, please contact Retreat committee chairs Dayna Weintraub and Seth Brown. Camp Nah-Jee-Wah needs this information so please make sure all the names of family members who will be joining us is included, as well as the ages of those attending. Please note that while the camp is a "nut aware" camp, it is not a completely nut free camp. They will not serve any peanuts at camp or cook with peanuts.